The EA generates signals about changes in the trend. Signals can be generated using different RSI-based strategies. When a position is opened, it is equipped with a take profit and a stop loss. If the position becomes profitable, a dynamic stop loss based on the specified values (TrailingStep and DistanceStep) is set for it and constantly trailed. This allows you to always close positions in profit. LotSize = 0.01 - fixed position volume. LotAutoSize = false - enable dynamic calculation of the position volume. LotSize is ignored. LotRiskPercent = 25 - risk to determine the position volume. It is calculated based on the free margin, available equity and the leverage. MoneyRiskInPercent = 0 - risk as a percentage of the capital, for safety reasons, the recommended value is 32. 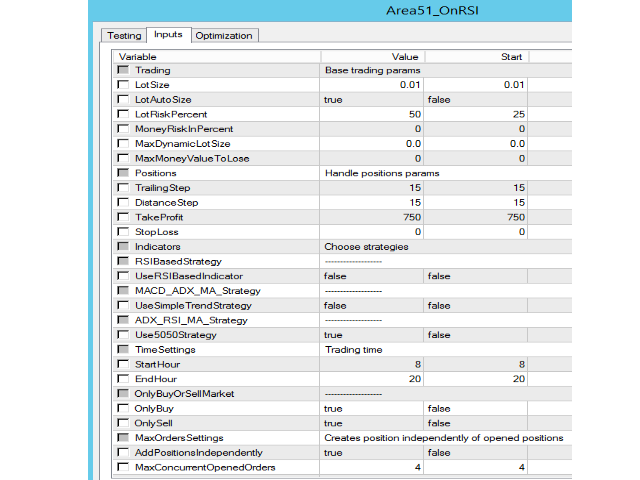 When the specified percentage is reached, all positions with the same MagicNumber are immediately closed on all charts. MaxDynamicLotSize = 0.0 - the maximum allowable lot size when the LotAutoSize function is active. If the entered value is greater than the maximum allowed value for the trading instrument, the maximum value for the instrument is used. MaxMoneyValueToLose=0 - the maximum amount of risk in money. TrailingStep = 15 - distance from the position opening price to set trailing stop. DistanceStep = 15 - step from the current price to move the trailing stop. TakeProfit = 750 - it should also be set for protection against gaps. StopLoss = 0 - 10000 points by default. UseRSIBasedIndicator = true - use the RSI-based indicator. 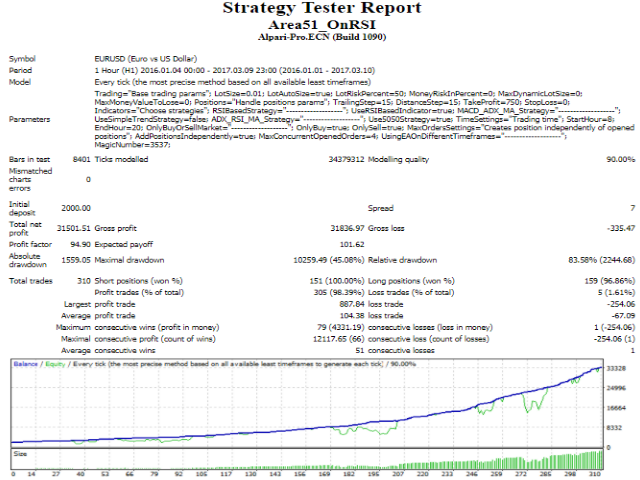 UseSimpleTrendStrategy = false - strategy based on MACD and moving average. The ADX indicator provides additional support. Use5050Strategy = false - Based on RSI value: Value greater than 50 means a purchase signal, otherwise a sales signal. If buy/sells are predominant on the market, you can enable signals only for buying/selling. AddPositionsIndependently = false - allows opening positions on every signal, regardless of the positions already opened by the robot. MaxConcurrentOpenedOrders = 4 - the maximum number of positions that can be open at the same time. MagicNumber = 3537 - must be unique for each symbol. i have bought for a few days but i can not use it because Author does not answer any questions i have made.